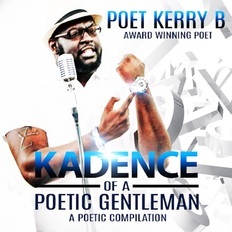 Poet Kerry finishes 2015 with his fourth album, Kadence of a Poetic Gentleman: A Poetic Compilation. Listen as this smooth poet releases his thoughts on love, spirituality and artistry. Featuring tracks such as "King," "Love at First Sight," and "Christian. CLICK THE CD TO ORDER KADENCE OF A POETIC GENTLEMAN! Kerry B comes back with his third spoken word CD, Urban Griot. Listen as this word artist speaks inspirational and thoughtful messages on the mic alongside some urban beats. From "Phoenix" to "Praise," Kerry B uses his God-given gift to inspire and teach listeners about issues, from racism to family. Gather around and listen to an Urban Griot. CLICK THE CD TO ORDER URBAN GRIOT! Kerry B enters 2014 with a dedication to some of today's classic R&B songs with his smooth spoken word. A collection of erotica and sensual poetry, he paints each scene with his flow and wordplay. Nominated by Poetry N Motion Newsletter for the Top 50 Sexiest Male Poets, Kerry B shows you the reason with his Soulful Seductions. Turn the lights out, light the candles, and let this spoken word artist take you on a journey that you will never forget. CLICK THE CD TO ORDER SOUL SEDUCTIONS! Kerry Brackett brings you a second helping of poetry with An Open Table. Describing some of his experiences through verses and stanzas, Brackett mesmerizes readers with his rhyme scheme and style. Take a seat and relax as your drinks are on your way. CLICK THE BOOK TO ORDER AN OPEN TABLE! Kerry B's spoken word demo Midnight Sunrise invites you to take a tour into the mind and testimony of an artist with words. Sit back, relax, and enjoy the wordplay. Open your eyes to witness the art of a Midnight Sun. CLICK THE CD TO ORDER MIDNIGHT SUN! A sampler of poems from Mr. Kerry Brackett (Kerry B) that talks love, life, and everything in between. Enjoy the rhymes that describe some of Brackett's experiences growing up. Taste the sweetness of love. Endure the bitterness of truth. Enjoy the scrumptious stanzas of Soul Appetizer. Here's a fresh basket of dinner rolls, your order is coming soon..
Click the book to purchase a copy of Soul Appetizer: A Sampler!